Located just 200 yards from Eden Isle Marina, this new custom built rustic cabin has all the luxury and high tech conveniences of the most modern vacation home including HIGH SPEED WiFi. The home is located in the exclusive resort of EDEN ISLE, which is a large peninsula on Greers Ferry Lake close to the Red Apple Inn & Country Club. This vacation getaway is situated on a heavily wooded lot surrounded by nature. Whether you are a water person or not, this exclusive area has something for everyone. Boating is 2 minutes away at the marina. Golf, spa, tennis and dining are only 2 minutes away at Red Apple Inn & Country Club on Eden Isle. Trout fishing is only 15 minutes away on the Little Red River. Movies, bowling, shopping and restaurants are just 10 minutes away in nearby Heber Springs. Perfect getaway for fun at the lake, fall foliage watchers, family memory makers, girls retreats, guys golf outings, trout fishing retreats, corporate outings, or a romantic couples weekend. Home features 4 BR, 2.5 baths and WiFi. 2 bedrooms upstairs both have king size beds. 2 bunkrooms downstairs feature 8 twin bunks. Large deck and screened porch with outdoor dining for 8. Front porch with porch swing for morning coffee or a good book. 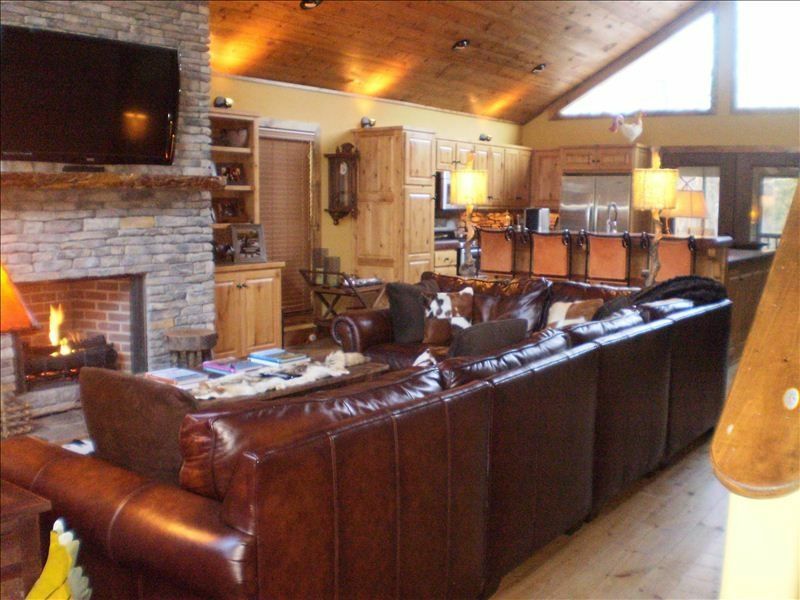 Greatroom features huge rock fireplace and large flat panel TV and DVD. Both girls and boys bunkrooms have TV and DVD. Large fully featured professional grade kitchen with indoor dining space for 10. Fire pole. CHECK IN TIME IS 3:00 P.M. AND CHECK OUT TIME IS 11:00 A.M. ABSOLUTELY NO SMOKING IN THE HOUSE OR SCREENED IN PORCH. NO PETS, NO EXCEPTIONS. ALL RESERVATIONS ARE FINAL INSIDE 30 DAYS AND NO MONEY WILL BE REFUNDED. ANYTHING MISSING FROM THE PROPERTY OR DAMAGED WILL BE DEDUCTED FROM YOUR DEPOSIT TO COVER THE FULL COST OF REPLACING THE MISSING ITEMS OR REPAIRING THE DAMAGE. Keywords: Located just 200 yards from Eden Isle Marina, you can walk to your boat instead of trying to find a parking spot at this busy marina. We built this Lakehouse on Eden Isle because it is the most private and relaxing lake community on Greers Ferry with a premier marina 200 yards from the homesite and The Red Apple Inn & Country Club just down the street where we can enjoy everything they have to offer. You will return home rejuvenated and energized after a stay at Eden Isle. It is a special place where you can continue to make family memories. One of the best rentals we’ve stayed in! Beautiful location and great accommodations! Plenty of room for all and great space to spend time. We would definitely come back! We've stayed at this location several times over the last couple of years and are always impressed. This property has plenty of room for guest and entertaining. It's always immaculate and guests always comment on how awesome this place is. Thanks for making such a fantastic property available. The location and scenery were spectacular. Had no problem checking in. We would definitely rent Eden Isle Cabin again. Second time to stay there and it was just as wonderful as the first. Had a blast! Beautiful house and wonderful place to enjoy family time. We will highly recommend it to our friends. Lovely surprise to find it belongs to the “famous” former B98’s Lisa Fischer👏�🏻�! Lie/lain - please use correctly😜� And so enjoyed the family photos and the wonderful books on the coffee table! Thank you for sharing your lake home with us! We had a great weekend. The location is very nice you can walk to the Marina. Neighborhood is very nice and laidback. Their is a golf course in the neighborhood. The home is a wonderful lake house. Interior is very well done. We loved the wood work. Kitchen was fully stocked with everything you would need. Much more like your home than a normal rental. Great screened in back porch and a huge fire pit. I would definitely bring the family here again. Fire pole should be used only under adult supervision with full liability shouldered by the renter. RATES *$350 per night (Excessive laundry like blankets, duvets and quilts having to be washed will result in additional charges) *2 night minimum non holiday *3 night holiday minimum *The weekly rate is $2100, so if you buy six nights @ $350 you get a seventh night free for an average of $300 per night Contact owner to discuss different methods of payment.